This site has been a long time coming and there are many reasons for that. I hope as you browse through the pages and products there is one thing that will stand out to you more than on any other site you may visit, especially a cake site….. that is, almost everything is unique! So that dear friends is why it has taken so long. Each and everything from a cupcake, a topper, a cake decorating class to a show stopping wedding cake has to be designed, priced, photographed, written about and then every conceivable combination of that product has to be individually loaded onto the site. A bit of a mission to say the least and in between all of that, here at Karen’s Cakes I and my fellow workers still have to do the day to day tasks of running a busy shop and everything that entails. So that’s the excuses, now for the Ta-Dah bit! 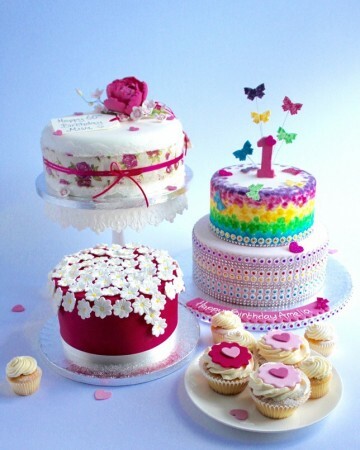 I am very proud of what we have so far, it is technically brilliant, you can sit in the comfort of your own home and order a virtually bespoke cake, the pictures show all those special little details beautifully and there are great little features like ‘help me choose a flavour’ and button to up-load an image to go onto your cake. 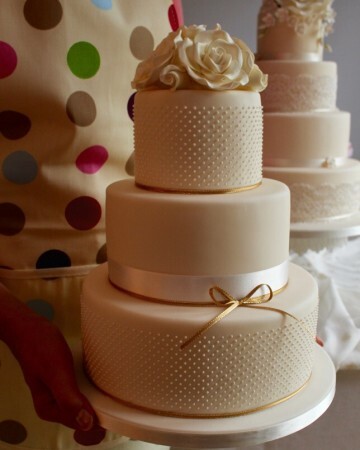 I’ve designed a new wedding cake collection with prices starting from just £195 for a 3 tier cake with 8 different flavours to choose from, 4 of which are completely new! There are also some new designs in our celebration and cupcake ranges which I hope you like and there are lots more in the pipe line to add. e currently working on will be our topper and accessory range. This will include many of the items we sell in the shop already, plus a few new and again unique to us products. So all I can say is keep popping back to see what’s new and I’d love to hear what you think via email, Facebook or next time you’re in the shop. Last Minute Cakes are available. How to make this show stopping Christmas cake!